Arcam BDP100 review | What Hi-Fi? 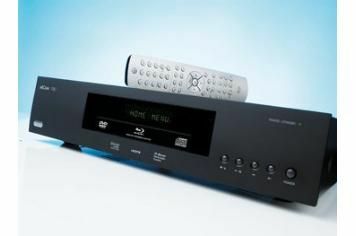 This test represents a second bite at the cherry for Arcam’s BDP100. When we originally gave the player back in February 2011 we were left flustered and frustrated, for the machine displayed bags of promise but was riddled with usability issues. Hopefully a few months further down the line, and with a few firmware updates under its belt, matters might have improved. And they have. Kind of. If you attempt to weave your way through the on-screen menus with speedy button-presses on the backlit remote, the player still has a tendency to resist and you’re forced to operate at a slower pace than with some rivals. Disc loading times still don’t match those of rivals either, but the player didn’t refuse to read any discs and only crashed once during the test. So the improvements are baby steps as opposed to giant leaps, but it’s still progress compared to what we experienced back in February. But while firmware updates have helped alleviate some of the pain, these haven’t solved inherent problems with the player’s specification. While rival machines can act as multimedia hubs, there’s no attempt to support file streaming or DLNA. At the time of writing there still hasn’t been any word on the proposed update to make the BDP100 3D compatible. And even if this update does arrive, we doubt it will also include the provision of an extra HDMI output to help owners of non-3D-ready home cinema amps. We still find the absence of any multichannel analogue outputs (and the consequent lack of onboard decoding to analogue for Blu-ray, DVD, DVD-Audio or SACD) a startling omission, given the target market. The fact that these flaws exist is such a crying shame, because when you spin a disc, the Arcam is capable of moments of real brilliance. The Blu-ray of Paul looks remarkably clear – during the Comic-Con convention scenes, the player picks out all the fine detail in the colourful sci-fi costumes on display. Blacks are solid but the player isn’t stingy with shadow detail either. Spin a DVD, and the BDP100 keeps picture noise to a bare minimum, leaving you with an extremely detailed image. Skin tones are nicely judged, and textures are smartly rendered too. Sonically, the Arcam has no trouble matching its peers. Resolution and insight are right up there with the best. There’s a great sense of openness to movie soundtracks, and you can hear subtle nuances and effects that budget machines wouldn’t even acknowledge. Spin a CD and the sense of refinement and finesse is immediately evident. Rihanna’s What’s My Name sounds airy and spacious, letting you hear every note in its entirety. The BDP100 keeps good timing but doesn’t sound quite as sure-footed as some. As you can see, we don’t think the BDP100 has improved enough to raise its star rating from three to four. Yes, it has improved, but meanwhile the competition has moved beyond it in terms of features and price. And, being one of the most expensive in its sector, that’s exactly what this Arcam should be doing.